This entry was posted in Blog, New Whisky Releases and Bottlings and tagged Earl Magnus, Highland Park, St Magnus on 29 January 2011 by Mike. St. Magnus, second of the Earl Magnus Editions celebrates the life of St. Magnus a man of peace, contemplation and scholarly learning. It is a life story of Christian devotion and forgiveness, qualities that are not usually associated with the Vikings. Saint Magnus was murdered by his treacherous cousin Haakon and was canonised 20 years later. 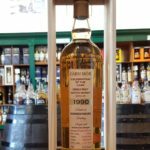 Bottled at a natural strength of 55% ABV, this limited edition 12 year old, drawn from casks laid down in 1998 and earlier years, provides an affordable and collectable piece of the Highland ParkÃ¢â‚¬â„¢s history. Only 11,994 bottles available. It is a shame that the UK is one of the last markets to have this whisky released into it so you probably all have this. We only have 2 bottles left and I haven't had mine yet so if you do want one hurry. At least here at The WSD we are matching the distillery price - fools that we are - we certainly wont get rich but at least we are not making ridiculous claims about the RRP to justify a higher price - you know who you are, shame on you (I do hope it was a mistake). Nose: At natural strength there is terrific intensity with classic dried fruits and honey sweetness. Thereafter glorious notes of cinnamon, dried apple and hints of exotic fruits emerge, followed by a whiff of aromatic smoke. Palate: Immediately intense and rich, the whisky lingers on the palate emphasizing the perfect balance between sweetness and aromatic smoke. Finish: Long and gently smoky.